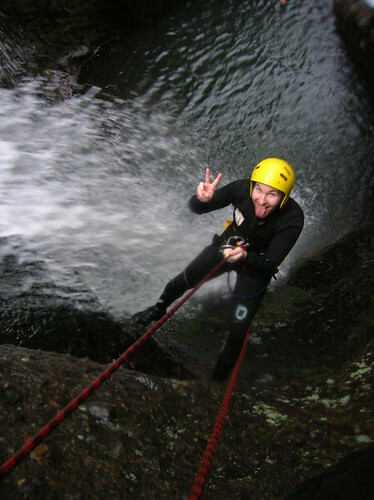 I'd wanted to go canyoning since I first learned about it in 2005 while planning a trip to Costa Rica. It consists of maneuvering down a river canyon by combination of hiking, sliding down natural rock chutes, jumping off cliffs and waterfalls, and abseiling (rappelling). The Rough Guide referenced canyons a 40-minute drive west of Auckland, so I made that adventure my first in New Zealand. There were 6 of us on the day trip, and our pretty guide was Connie from Chile, who'd been working in New Zealand for 9 months. She had a great sense of humor, and I felt quite comfortable entrusting my life and body to her. After picking up wet suits, harnesses and ropes from a local staging area, we hiked 45 minutes to the top of the canyon. It was a hard slog up muddy, steep trails. I had volunteered to carry a bag of ropes, which weighed heavily on me after only a few minutes! 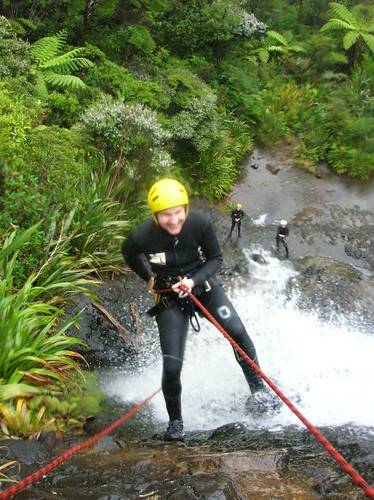 We received brief instructions on abseiling, and we were off to our first little waterfall leap – about 5 feet. We were immediately offered a jump twice as high into the same pool, and everyone accepted (I was joined by 2 Australian guys, and a couple from San Francisco). Everyone did every jump and suggestion by our guide the whole time, which was cool. Our highest jump was probably about 20 feet, a good 10 feet fewer than my personal high of 30 in Costa Rica, so I felt fairly comfortable doing all the leaps. Our first abseil was the highest – about 60 feet in my judgment, with the water falling atop our heads near the top. It was much tougher than a regular abseil (like I did in Belize last year – into a sinkhole) because the water is in your face, and the rocks are really slippery. Connie lowered us over one large waterfall which was my favorite, as we could just enjoy the view. We did a second abseil ourselves toward the end, which was a bit slippery, though easier since the waterfall wasn't so violent. Our lunch was seemingly small, however I gobbled up chocolate, 2 salami sandwiches and a granola bar in no time. We had lunch at the base of the first waterfall we abseiled, and there were freshwater eels there. The rock slides were my least favorite, perhaps because we were challenged to go down 2 of 3 backwards, and head first! Scarier than the jumps by far! I survived though, and we had another 30-45 minute hike downstream and out to the minibus. It was as adventurous a guided activity as you can probably find. Canyonz is the only tour operator in that canyon, and I didn't see another soul from beyond our group the whole time from hike in to hike out. At times, I felt a bit like Bear Grylls, though I'm horrible with impersonations, his commentary and body movements were in my minds as I leaped and hopped, and scurried up slippery mud/rock embankments. The whole tour lasted 8.5 hours from pick-up to drop-off in Auckland. We were in the (cold) water for about 5-6 of those hours, and despite the rain and clouds, the views were fantastic. It was my first time in a wet suit – not comfortable – though I got use to it after awhile. The cost was about $130, and in my opinion, worth every cent! 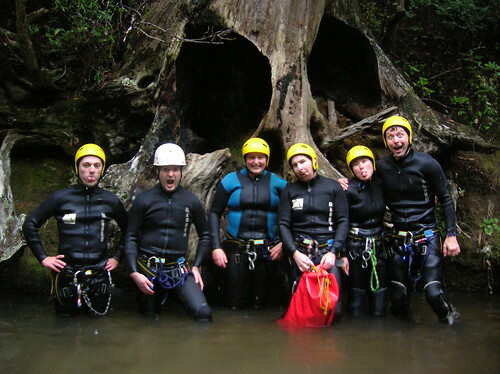 I recently returned from a trip to Costa Rica where we went canyoning for the first time!! Incredible! What a high, right? Thats an excellent deal – you will pay just as much or more for a few minutes bungy jump in Queenstown or a few hours jet boat ride. Dave first the pictures are great second what a fantastic time that looked like, makes this rainy overcast cold day in Texas disappear. enjoy keep safe watch pushing that knee to carry some ropes :grin: (show off)keep it up!!!!! I know – I can’t believe I’m volunteering to carry a bag of ropes on top of my wetsuit/gear. I survived though, and have an all day hike Saturday I just can’t resist taking. We’ll see how I do! way to go dave! that looks awesome. I’d love to try that. Wonder if they do it in the new river gorge in WV…. Amazing pictures, what an awesome day that must have been! I’m always too scared to spend a lot of money on something like that, but now I’ll definately have to try it! Out of interest could you let me know the name of the company that organised the canyoning for you? Hi. Your adventures sounds so fun! I read about your caving trip to Belize as well. I just got back from a trip to the Dominican and had wanted to go canyoning but didn’t get the chance to. Now, I’m headed to Belize-do you know of any canyoning places there? Thanks! Nope – though you can usually look up canyoning in the index of guidebooks to find out if it’s an activity in that particular country. It’s a lot of fun! You may want to check out James D. Brausch’s Costa Rica HQ, a guide for those wishing to visit or live in Costa Rica. Among the places James also mentions are Tabacon, Xandari and Costa Rican National Parks like the Arenal Volcano and the Chirripo National Parks. To get first hand information on these wonderful places and other bits and pieces about Costa Rica, visit James’ CostaRicaHQ.org. I am planning my Honeymoon to NZ, so EXCITED! Will this group: Canyonz p/u from hotel? Any prior mountain climbing experience required? I walked from my hostal to the travel office, and we met and left from there. Not sure if they do pick-ups — maybe. No prior climbing experience required.